The companies in the Resource Park are unique in many ways but do share some common characteristics. Most of the companies began their operation as high-tech start-up companies. Their operation is based on science, dynamic development operations, high staff education levels with income in accordance with their education and abilities, inventions and continuous development of new products. Opportunities for the Resource Park in the Suðurnes region to continue to grow and be more innovative are nowhere near being exhausted. Two companies within the Resource Park, ORF Genetics (ORF Líftækni) and Carbon Recycling, were nominated for the FVH Knowledge Award in 2015. The Blue Lagoon received this award in 2012. The underlying criteria for the award in 2015 was value creation through the unconventional use of resources, something that precisely describes the operation of Resource Park companies. The Resource Park has laid the foundations for diverse ecological industries that are in continuous development. The main products and operations of the Resource Park companies include: hotel operation, fish drying, production of goods made from fish offal, farming warm-water flat fish, traditional and health-related tourism, natural treatments for skin disorders, algae farming, eco-friendly cosmetics with active substances from the area, methanol from geothermal gas, hot and cold groundwater, steam, geothermal fluids, warm clean seawater, etc. The companies of the Resource Park are located in the neighbourhood of the power plants and form a community that is an excellent venue for scientific research, inventions and the development of new products which are, for the most part, exported. Hitaveita Suðurnesja became the first Icelandic energy company to be privatised in 2000. Following changes to electricity legislation in 2008, stipulating the separation between competitive operations and concession operations in energy companies, Hitaveita Suðurnesja hf. was divided up into HS Veitur hf. and HS Orka hf. HS Orka is Iceland’s third largest energy company, with approximately 8% of all electricity produced. 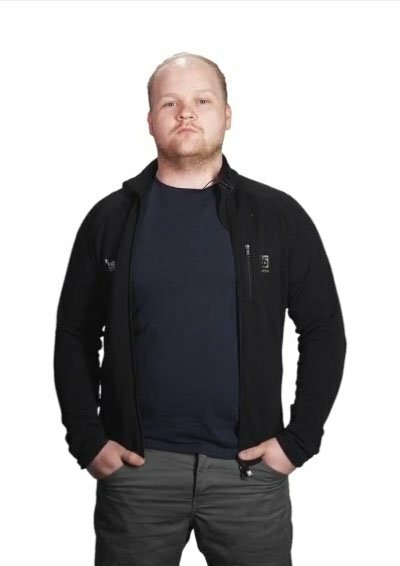 The company is owned by the Canadian power company Alterra Power, which holds 2/3 of the shares in the company, and Jarðvarmi slhf., a company owned by Icelandic pension funds, holding 1/3 of the shares. HS Orka is the only large Icelandic energy company that is not owned by government and municipal entities. The object of HS Orka is to serve industries and homes through the multiple, sustainable utilisation of resources for the harnessing and sale of eco-friendly energy and other products for the benefit of its customers and society as whole. HS Orka owns and operates two power plants at Svartsengi and in Reykjanes. The capacity of the geothermal plant at Svartsengi is 74 MWe of electricity and 150 MWth of heat energy. The geothermal power plant was built in six stages between 1976 and 2015. The heat capacity will be increased by 40 MWth in the spring. 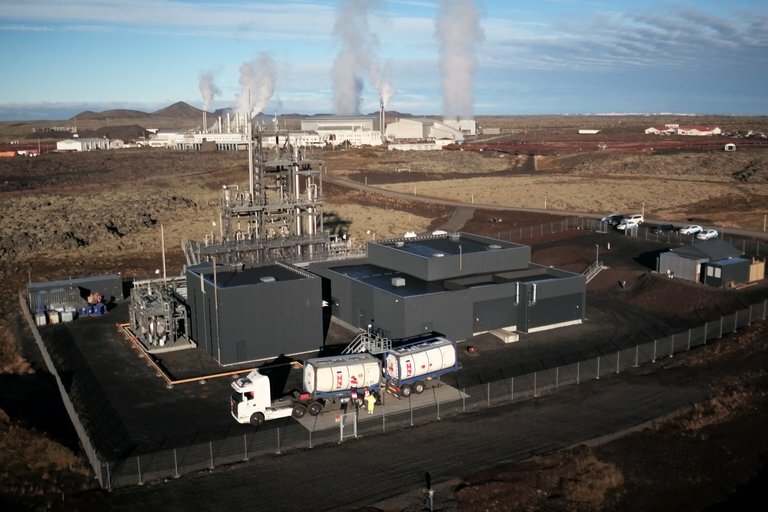 In addition, the plant at Svartsengi processes fresh groundwater from the nearby lava fields for distribution in the Suðurnes region as hot and cold potable water. The geothermal plant at Svartsengi is the first geothermal plant in the world to produce hot water for both heating utilities and electricity, i.e. a CHP plant (Combined Heat and Power). 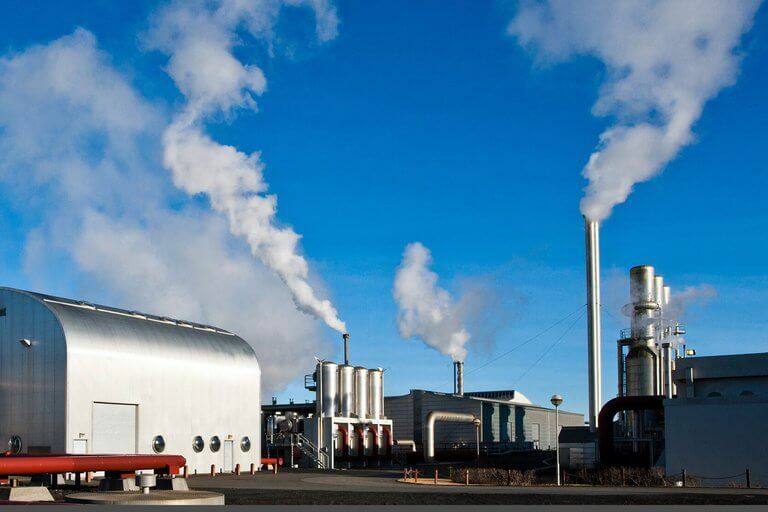 Electricity production began at Reykjanes in May 2006 with the geothermal plant producing 100 MWe of electricity in two 50 MWe steam turbines. The plant’s condensers are seawater cooled and use approximately 1,600 l/s of clean seawater, filtered through lava layers and extracted from boreholes. This warm seawater is then used by Stolt Sea Farm Iceland in their highly productive warm-water fish farming in Reykjanes. This integrated production of heat and electricity makes HS Orka’s geothermal plant unique on a global level. HS Orka has 60 employees with a broad range of backgrounds: geology, reservoir engineering, civil engineering, technology, mechanical theory, electrical engineering, motor mechanics, business administration, etc. During the 40 years in which the company has been operating, extensive experience has been gathered in the operation of most types of geothermal turbines, heat exchange, control valves, steam separators, separator mufflers and other equipment used in geothermal plants. Harnessing geothermal energy in the Suðurnes region has always been a challenge due to high salinity, precipitates and metal corrosion. These challenges have resulted in a company culture characterised by solution-driven teamwork. A solid knowledge of the groundwater and geothermal resources, an understanding of the importance of teamwork, experience in working with Icelandic and overseas manufacturers of technical equipment, an understanding of the importance of uninterrupted delivery of the resource streams of the geothermal plants and solution-based work are important aspects in the development, operation and success of the Resource Park. HS Orka is engaged in the development of new geothermal and hydrothermal plants. In reality, the projects do not consist of power plant development, i.e. simply the production of electricity, but rather the formation of varied new resource parks, each with its own distinctive features. Each and every resource park is characterised by its environment and the nature of the resources of the location in question. In 2015, HS Orka received the award issued by the Icelandic Satisfaction Poll in the category for companies in the energy industry. The award has been presented for the past 13 years and the company has received it on 12 occasions. In addition, the company was awarded the preventative action prize of VÍS and the Administration of Occupational Safety and Health 2015. The prize is awarded for the use of exceptional preventative measures and environmental and safety measures. HS Orka is Iceland’s third largest energy company, with approximately 8% of all electricity produced, i.e. 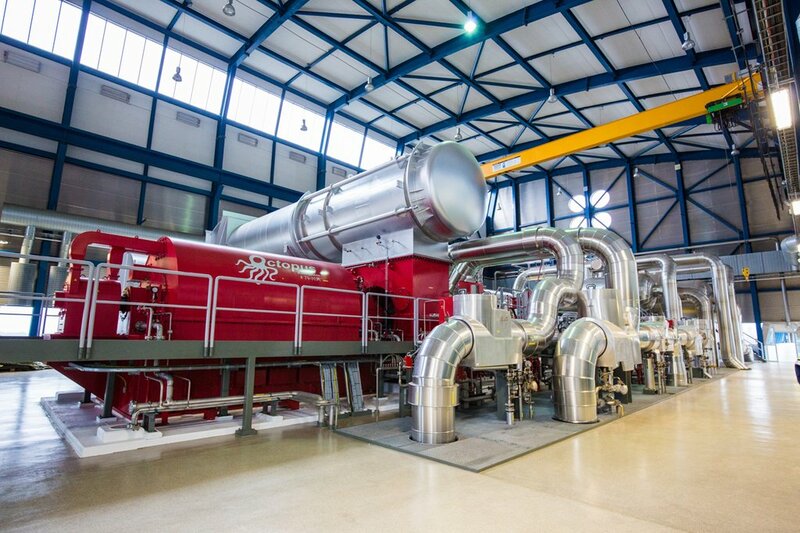 a CHP plant (Combined Heat and Power). The geothermal plant at Svartsengi is the first geothermal plant in the world to produce hot water for both heating utilities and electricity. In 2015, HS Orka received the award issued by the Icelandic Satisfaction Poll in the category for companies in the energy industry. 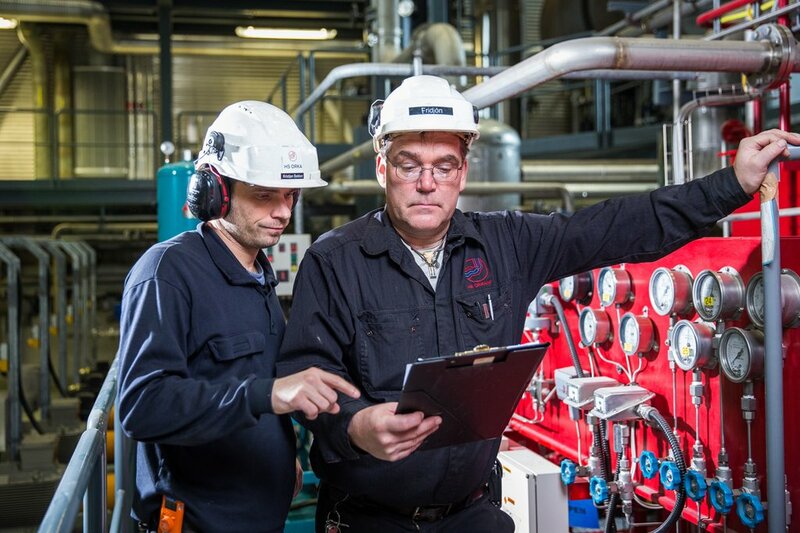 Following the changes made to electricity legislation, Hitaveita Suðurnesja hf. was divided into two independent companies in 2008: HS Orka hf. and HS Veitur hf. HS Veitur, an established and well-operated utilities company, has grown and become stronger through mergers with other utilities companies. 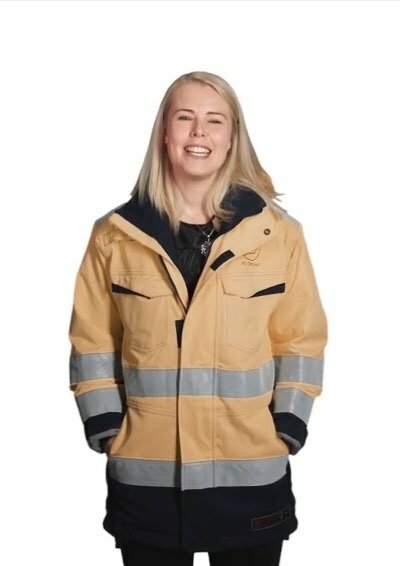 The company is responsible for the distribution of electricity, hot water and groundwater and operates in four areas: Suðurnes, Hafnarfjörður, Árborg and Vestmannaeyjar. The company distributes electricity to approximately 76,000 residents in Iceland and uses for this purpose approximately 1,900 km of low- and high-voltage cables as well as numerous transformer stations and distribution centres. 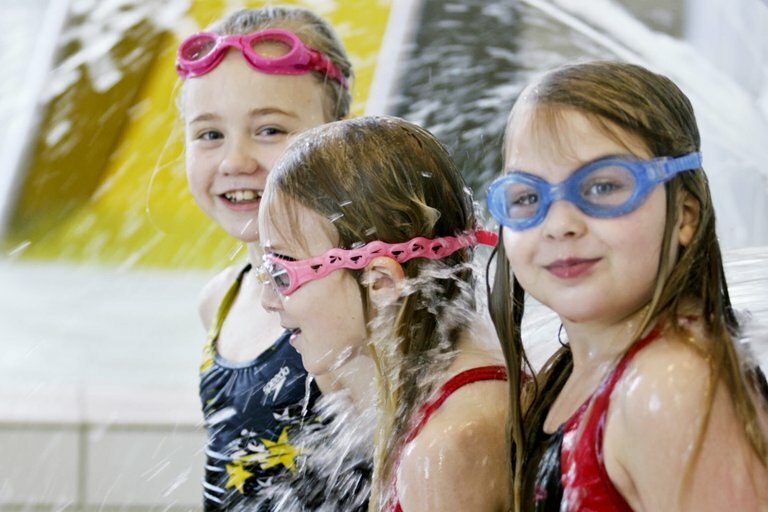 Hot and cold groundwater from HS Orka is distributed by the company to approximately 25,000 residents in the Suðurnes region and Vestmannaeyjar. The company, therefore, provides important basic services to a large proportion of southwest and south Iceland. The company employs approximately 90 people. The company distributes electricity to approximately 76,000 residents in Iceland. Hot and cold groundwater from HS Orka is distributed by the company to approximately 25,000 residents. The Blue Lagoon is an innovative and pioneering company that was established in 1992 by Grímur Sæmundsson, MD and Managing Director of the company, and Edvard Júlíusson, an innovator and entrepreneur in Grindavík. The company has focused on research and development over its 20-year history. The result of this work is a multi-layered operation based on the geothermal resources in Svartsengi. The Blue Lagoon is a unique example of the multiple and sustainable use of geothermal energy and is also a good example of the manner in which natural resources can be used for value creation. The Blue Lagoon itself is the aspect of the operation that is best known. The Blue Lagoon is now on National Geographic’s list of the Wonders of the World and, at the same time, is one of the most popular destinations of foreign tourists who visit Iceland. About one million guests visited the lagoon last year. The company focuses on providing all guests with an experience of exceptional quality. The company’s goods and services have been developed to this end. Spa treatments and massages in the lagoon are particularly popular. 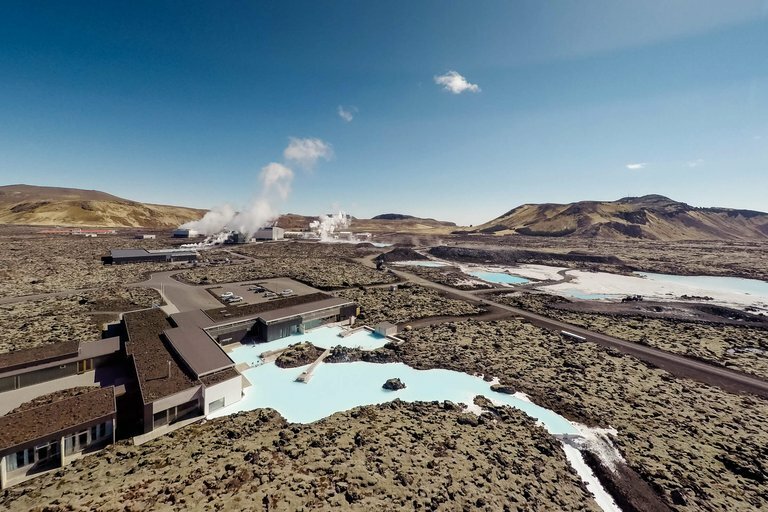 The healing properties of the Blue Lagoon for psoriasis patients was discovered soon after people began bathing in the runoff water lagoon that formed soon after Hitaveita Suðurnesja began operations. A great deal has happened since. Detailed scientific research has been carried out on the healing properties of the water in the lagoon and the resulting data has supported the findings. 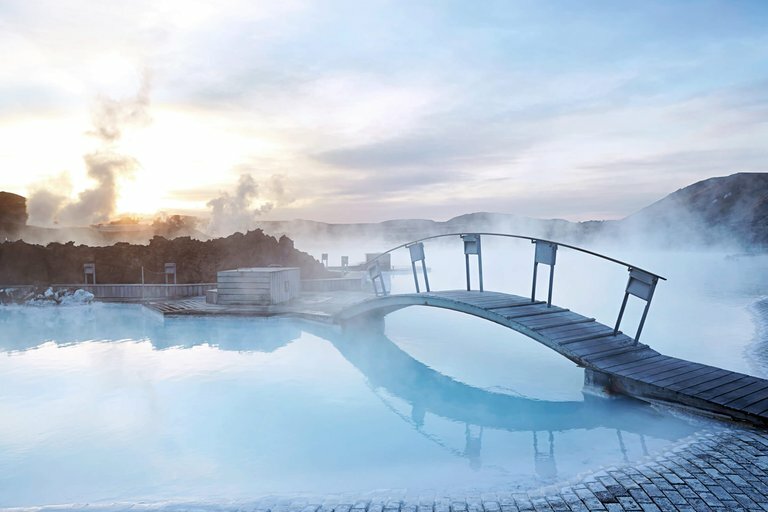 The Blue Lagoon’s psoriasis treatment has been recognised by health authorities in Iceland as well as in Denmark and the Faeroe Islands. Guests from over 30 nations annually receive the treatment provided by the Blue Lagoon Clinic. The Clinic has state-of-the-art treatment facilities with a separate private treatment lagoon. The hotel part of the Clinic has 35 rooms. The Blue Lagoon skin care products are based on a unique blend of Blue Lagoon geothermal seawater active ingredients. The first products were put on the market in 1995. Based on continuous research, Blue Lagoon has expanded their line to a highly developed skin care line with a complete range of face and body products which enhance radiance and prevent aging signs. 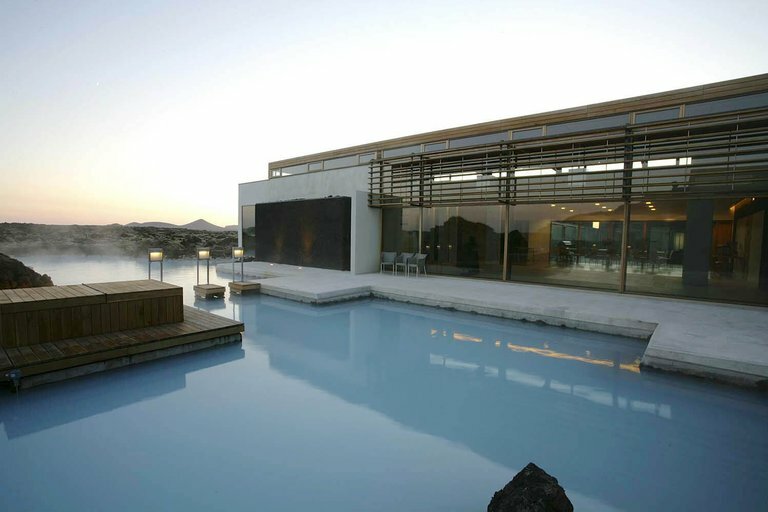 The Blue Lagoon processes the active ingredients from the raw materials of the geothermal fluid, such as silica, salts and algae, to use in the company’s skin care and health products. 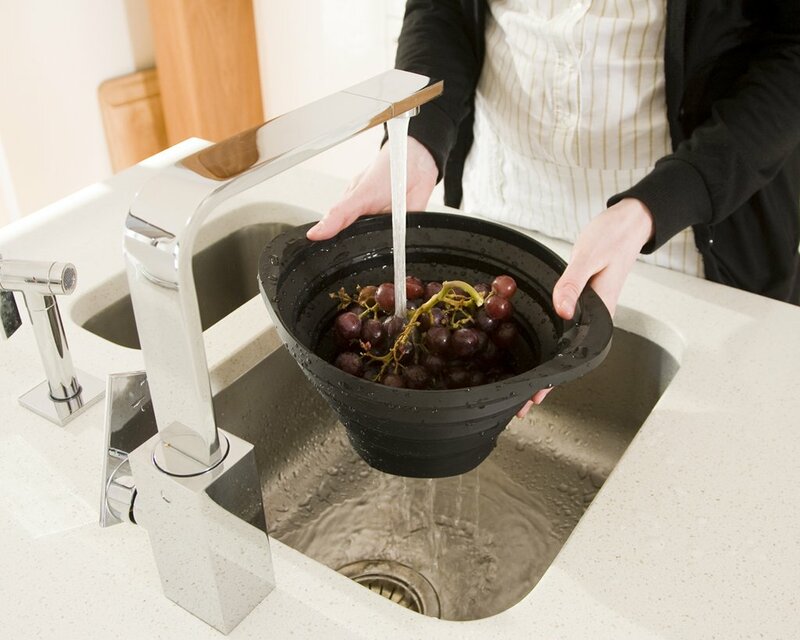 The processing methods are sustainable and environmentally friendly. The raw materials processing is a good example of utilising the various resource streams from a geothermal plant. The processing uses the geothermal fluid, hot steam to produce salts and geothermal gases to feed algae, as well as uses electricity, hot and cold water. The Blue Lagoon seeks to arrange its production of skin care goods in a sustainable and environmentally friendly manner. 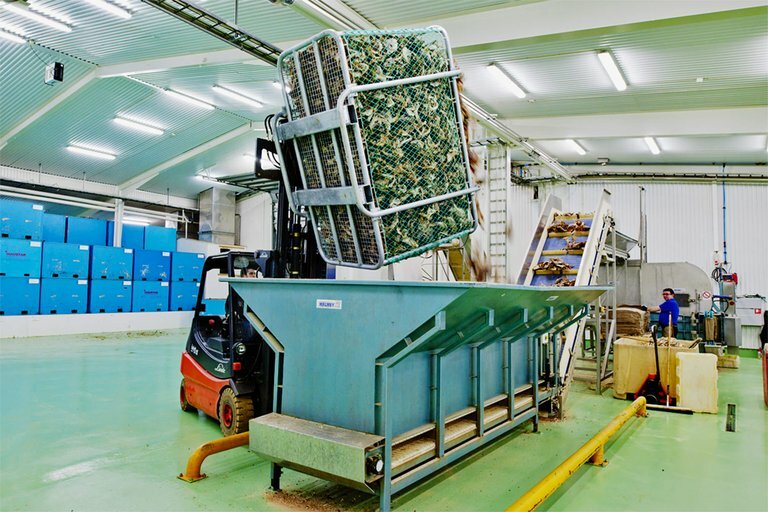 It should be noted that the Blue Lagoon relies exclusively on raw materials sourced in its nearest environment and has also developed green processing methods for its raw materials. An important step was taken in 2012 when the Blue Lagoon began using CO2-rich geothermal gas from HS Orka’s plant in Svartsengi; the geothermal gas, which was not being used for HS Orka’s electricity production, is used as food for the algae. Transforming the exhaust of energy plants into high-value products, as is done by the Blue Lagoon on an industrial scale, is wholly unique. 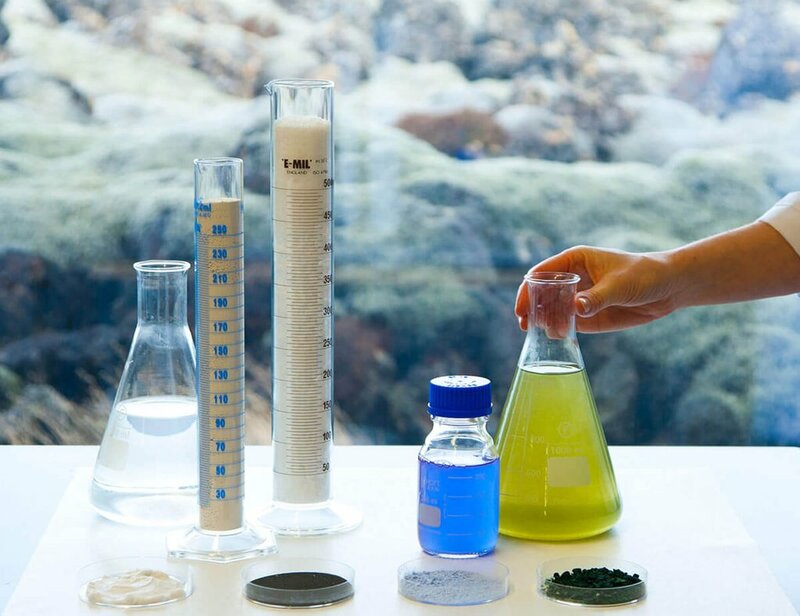 Skin care products containing micro-algae fed on geothermal gas are now in production and for sale in the Blue Lagoon’s shops. Ever since its establishment, the company has focused on researching the Blue Lagoon’s ecosystem, the efficacy of the natural ingredients found therein and their effects on the health and wellbeing of those who enjoy their benefits. Highest on this list are the decades-long clinical studies into the healing properties of the Blue Lagoon water for psoriasis patients, as well as research into the active ingredients of the skin care products as regards skin aging, carried out in co-operation with an overseas research team specialised in this area. All these years of knowledge development strengthens continued innovation and product development within the Blue Lagoon and makes the company more competitive, while also being the basis for the further growth of the Blue Lagoon. The Blue Lagoon leads the way in the cultivation of algae, having cultivated algae for 20 years. 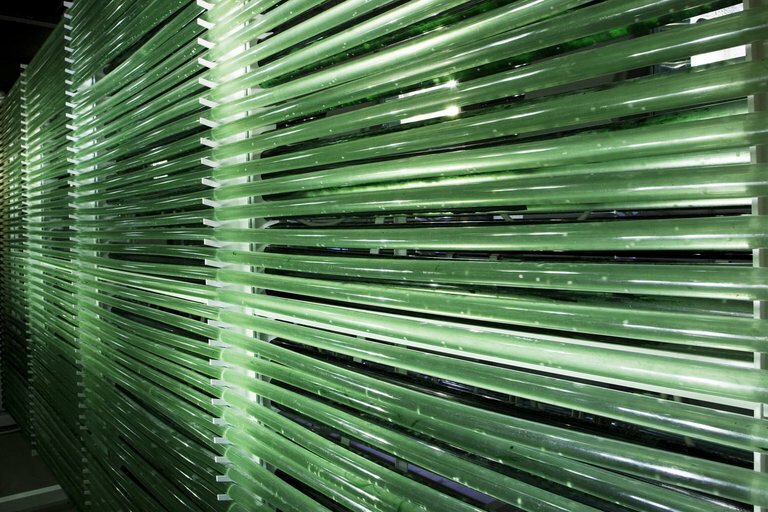 The algae are cultivated in photosynthesis equipment under controlled conditions. An important step was taken in 2012 when the Blue Lagoon began using CO2-rich geothermal gas from HS Orka’s geothermal plant to feed the algae. Transforming the exhaust of geothermal plants into high-value products, as is done here on an industrial scale, is wholly unique. The Blue Lagoon employs around 700 employees. The jobs are extremely varied. The Blue Lagoon employs, for instance, physicians, nurses, pharmacists, actors, production masters, chefs and people educated in business, public relations and marketing. Haustak is located near HS Orka’s geothermal energy plant in Reykjanes. The company dries fish heads and bones in fresh air heated with geothermal steam. The products are then exported to Africa. Almost all production of dried marine products is sold to Nigeria, where Iceland has an approximately 70% market share. In addition to fish head drying, Haustak is engaged in interesting development work. Fish offal has usually had to be buried, with the attendant cost. The company has now developed a method to process valuable oils from the offal. The company Codland has been founded in Grindavík to develop biotechnical methods to process bioactive compounds from fish offal. In addition, the company is involved in diverse product development. The company plays a large role in the full utilisation of marine catches, something Icelanders are well known for both here and abroad. Laugafiskur is a fish drying company located near the geothermal plant of HS Orka in Reykjanes. The company dries fish heads and bones in fresh air heated with geothermal steam. The products are then exported to Africa. The company is involved in diverse technology and product development. The company participates extensively in efforts to fully utilise marine catches, and its efforts have attracted attention both in Iceland and overseas. Haustak has developed a method to process valuable oils from the offal. 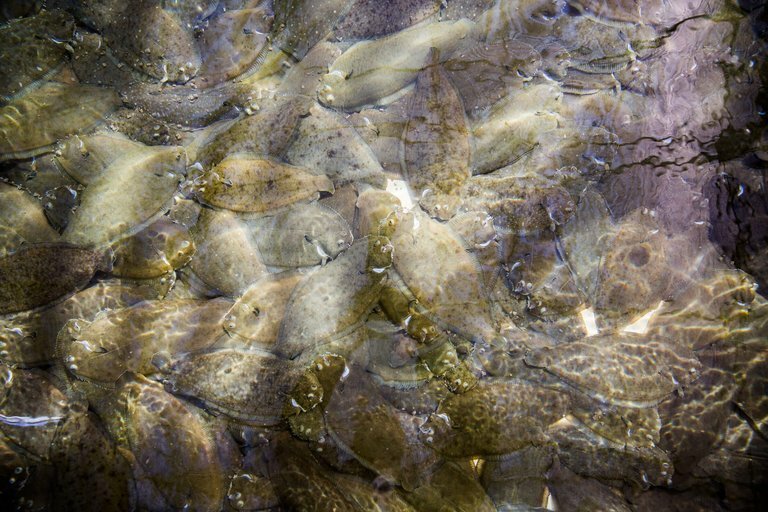 Codland has been founded to develop biotechnical methods to process bioactive compounds from fish offal. Almost all production of dried marine products is sold to Nigeria, where Iceland has an approximately 70% market share. Laugafiskur dries fish heads and bones in fresh air heated with geothermal steam. The Northern Light Inn was built in 1983, with 12 rooms. It has now been enlarged to 32 rooms. In addition, a restaurant and meeting room seating up to 150 persons has been added. The name of the restaurant is Max’s Restaurant. 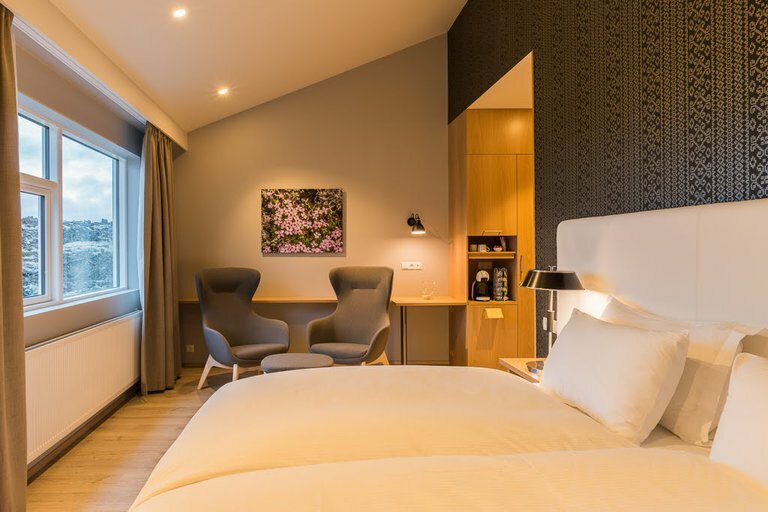 The hotel’s location is first and foremost due to its proximity to the Blue Lagoon, HS Orka’s geothermal plant and how easy it is to watch the aurora borealis on winter evenings. In addition, its proximity to Keflavík International Airport and the stunning geology of the Reykjanes peninsula were deciding factors in its location. 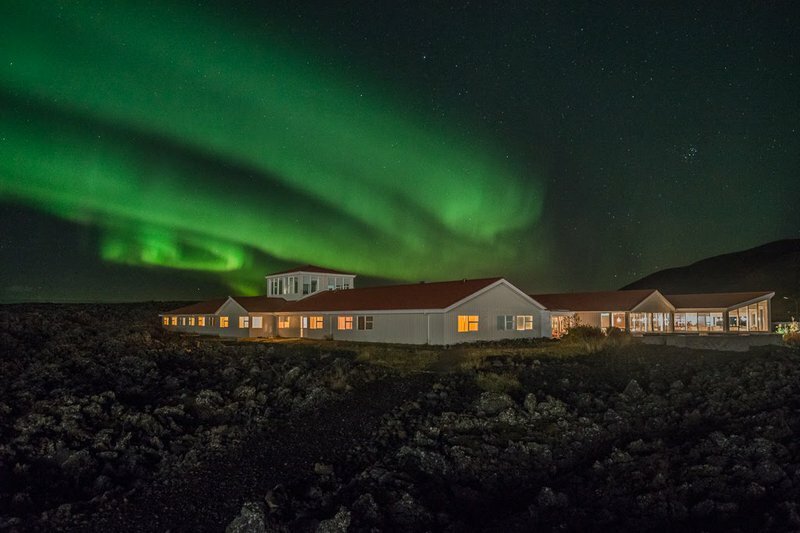 The Northern Light Inn is a good example of a company in the tourism industry that not only uses the resource streams from HS Orka’s geothermal plant, but also the resources of the natural environment. The hotel has often hosted scientists, experts from foreign companies servicing HS Orka’s geothermal plants and groups of people who have come specifically to Svartsengi to attend geothermal workshops and learn about the operation of the geothermal plant and, most recently, the Resource Park. The hotel provides the companies within the Resource Park with first-rate services and is an active member of the Park. The hotel’s location is first and foremost due to its proximity to the Blue Lagoon, HS Orka’s geothermal plant and how easy it is to watch the aurora borealis. The Northern Light Inn not only uses the resource streams from HS Orka’s geothermal plant, but also the resources of the natural environment. ORF Genetics is a leading biotechnology company founded by three scientists in 2001. Ten years of biotechnology research formed the foundation of the company in its present form. The company manufactures and sells growth factors for medical research and skin care products. ORF’s products are based on unique genetic technology that makes it possible to produce growth factors and other proteins in barley. 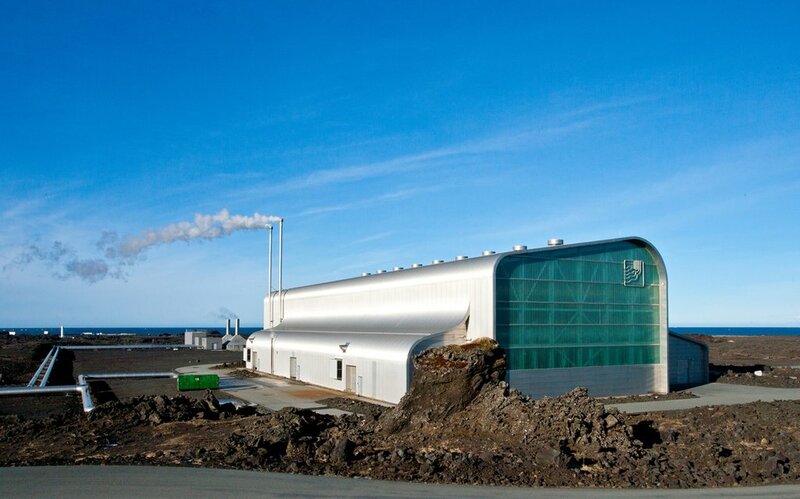 In 2008, ORF built a 2,000 m2 greenhouse in Grindavík, not far from the geothermal plant of HS Orka. The greenhouse is commonly referred to as the Green factory. 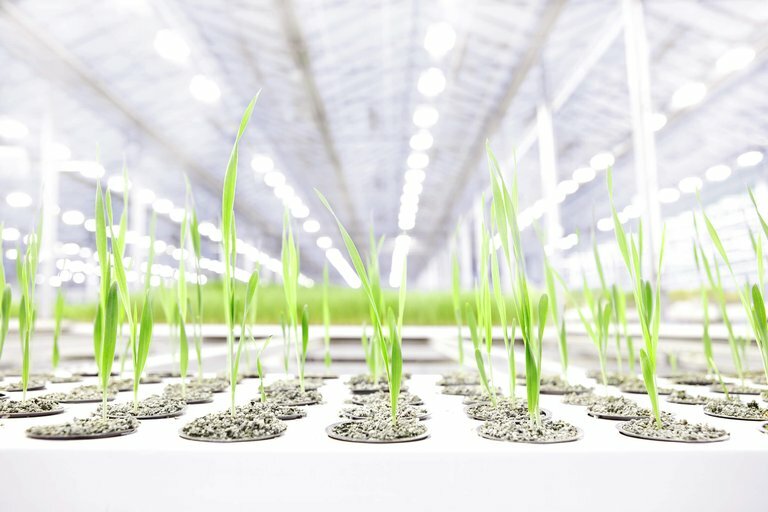 In this high-tech greenhouse where full control of all external conditions is maintained, around 130,000 barley plants are hydroponically grown in pumice for 90 days. The growth factors/cytokines are manufactured in the seeds of the plants. The field of application of cytokines is extremely broad: stem cell research, cell cultivation, tissue cultivation, stem cell therapy, organ implants, medicinal products, skin care products, etc. The production is green in the sense that it binds more carbon dioxide than it discharges into the atmosphere. ORF is the only company in the world that has developed and put on the international consumer market a brand based on plant biotechnology. ORF’s subsidiary, Sif Cosmetics, produces and sells cosmetics under the EGF brand in Iceland and BIOEFFECT overseas. Clinical studies by respected foreign scientists have shown the efficacy of the cosmetics in combatting skin aging. The products are currently sold in over 700 shops in 25 countries. Carbon Recycling International (CRI) is an example of an innovative company that takes advantage of numerous resource streams from the geothermal plant in Svartsengi. CRI operates an innovative factory near the geothermal plant and manufactures methanol for the manufacture of vehicle fuel and to mix with petrol. The factory receives geothermal gas which is a mixture of carbon dioxide (CO2) and hydrogen sulphide (H2S) from the geothermal plant. Once the hydrogen sulphide has been cleaned from the geothermal gas, the carbon dioxide is mixed with hydrogen obtained from splitting water into hydrogen and oxygen molecules through electrolysis. The mixture then undergoes a chemical reaction that forms methanol. The chemical processes have been developed by CRI, and some parts of the processes are protected by the company’s patents. CRI began the experimental operations in the factory in 2012. It production capacity was 1.5 million litres of methanol per year. The factory has now been enlarged and its production capacity increased to 5 million litres per year. Once trials have been completed, the factory is expected to be fully operational by the end of 2015. CRI exports some of its production to the Netherlands where the methanol is mixed into petrol to raise its octane number. A proportion of the methanol is exported to Sweden where it is used in the manufacture of biodiesel. A small proportion of the production is also used here in Iceland to manufacture biodiesel. CRI is, at present, designing a methanol factory in Germany which will in all likelihood begin operations in 2017. As the design of the factory and research relating to the project is in the hands of Icelanders, one can say that specialised Icelandic knowledge, technology and experience has become one of the Resource Park’s exports. A part of CRI’s future plans in Iceland is to examine the possibility of building a fuel factory linked to the geothermal plant of HS Orka at Svartsengi that would have a production capacity of approximately 40 million litres of methanol a year. If realised, the project would represent an investment of up to ISK 5–6bn. CRI operates an innovative factory near the geothermal plant and manufactures methanol for the manufacture of vehicle fuel and to mix with petrol. A part of CRI’s future plans is to examine the possibility of building a fuel factory that would have a production capacity of approximately 40 million litres of methanol a year. CRI exports some of its production to the Netherlands where the methanol is mixed into petrol to raise its octane number. 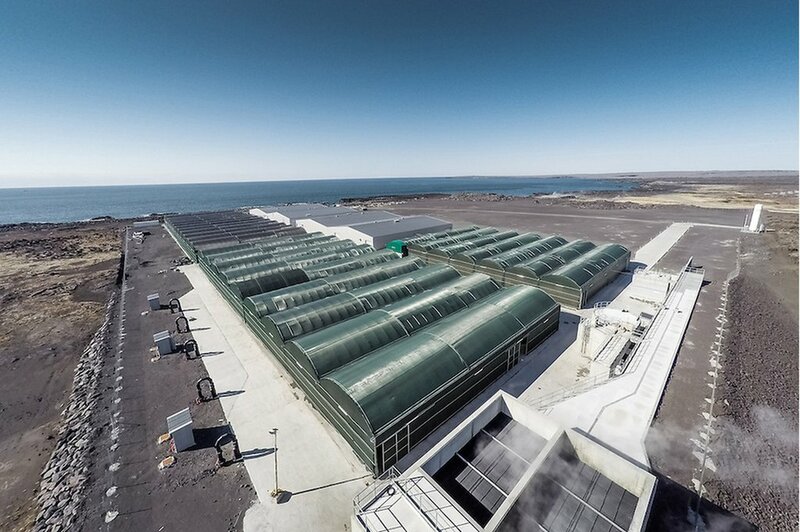 The fish farming company Stolt Sea Farm Iceland, established in 2012, owns and operates a high-tech fish farm on the Reykjanes peninsula not far from HS Orka’s geothermal plant. The company is owned by the Spanish company Stolt Sea Farm, established in 1972, which is a subsidiary of Stolt-Nielsen Limited. Stolt Sea Farm produces turbot, plaice, sturgeon and caviar. The farming is extremely high-tech and takes place in specially designed aquaculture stations. The operation is based on years of research and development that covers the biology, feeding habits and life cycles of the species. The condensers of the turbines of the geothermal plant in Reykjanes are cooled with seawater from boreholes, which has been filtered through the lava layers. The filtered water comes to the condensers at a temperature of around 8–9°C and leaves them at a temperature of around 35°C. A proportion of the lukewarm (35°C) seawater is piped to the fish farm. The fish farm mixes the lukewarm seawater with filtered cold borehole seawater to achieve the optimal temperature for the fish. A steady stream of completely clean seawater at an optimal temperature for the fish farm throughout the year is a unique prospect that increases the safety and capacity of the farm. The operation and sale from the first stage of the fish farm has begun, and its capacity is over 500 tonnes per year. The farm rears Senegal sole for exportation. The sole is an expensive, sensitive high-quality fish that is exported unprocessed. The farm is designed to have a capacity of 2,000 tonnes per year and will therefore be enlarged in the future. The first stage of the farm employs 20 workers. This number will rise to 70 employees once the farm has been enlarged. The fish farm mixes the lukewarm seawater with filtered cold borehole seawater to achieve the optimal temperature for the fish. The operation is based on years of research and development that covers the biology, feeding habits and life cycles of the species. The farm is designed to have a capacity of 2,000 tonnes per year and will therefore be enlarged in the future.